Seamless is not an adjective often used in healthcare. The highly fragmented nature of the way we operate, particularly when it comes to our IT infrastructure, is not only a frequent source of frustration but an impediment to delivering high quality care. Fortunately, there is now an effort on the part of multiple stakeholders to try to reshape how the healthcare system operates on a national level with some sort of unified health record as well as on the local level with system integration within facilities. In the mHealth industry, this effort is manifested by the increasing trend of providing APIs to proprietary systems and the development of platforms on which custom systems can be delivered. Here, we’ll look at some particularly interesting and exciting companies that share that vision. Editor Note: We encountered these companies first at the Health:Refactored conference held earlier this year, which is where many of the quotes below were obtained. Nuance, known for speech recognition with Dragon Dictate & Dragon NaturallySpeaking desktop products, offers mobile developers secure, cloud-based speech-processing subscriptions for medical speech recognition and clinical language understanding (CLU). According to Jonathon Dreyer of Nuance, more than 650 partners use their 360 Development Platform, including Cerner and Epic’s electronic medical record mobile products. In fact, hospitals are also building their own applications on this platform. Some specialty-specific apps, such as various orthopedic tools, the EZDerm dermatology map app, and the CareThreads care coordination tool, have been published. 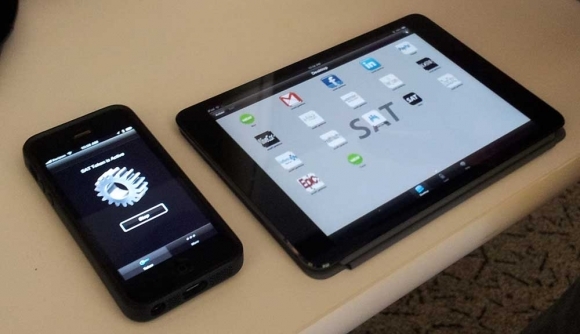 One particular company, Sense.ly, features an app that helps manage chronic conditions from a smartphone. Their company is evaluating their app using clinical trials involving both addiction medicine patients and a PM&R (physical medicine & rehabilitation) clinic’s patients. 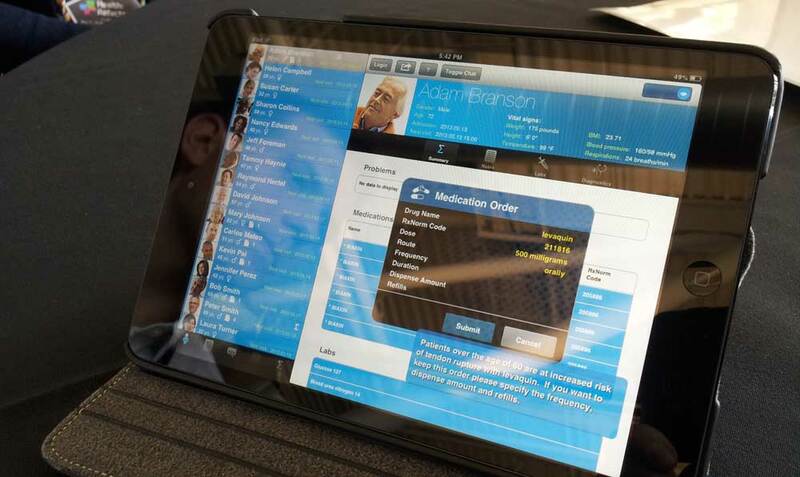 Their app features a 3D physician-like avatar using Nuance’s voice recognition platform. Sense.ly’s avatar speaks with patients and listens to the patients for their answers. 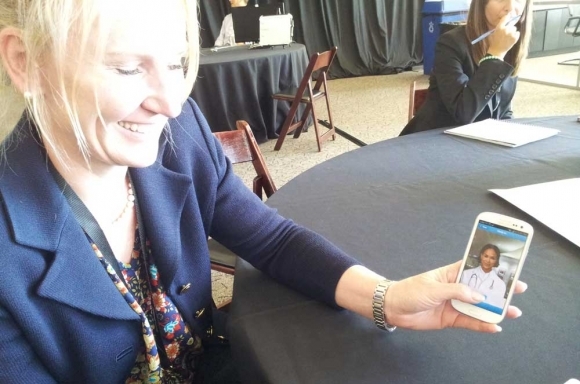 This avatar can literally interview patients regarding their diabetes, insomnia problems, and even psychiatric symptoms — and sends the data to medical providers. The team, led by engineer & entrepreneur Adam Odessky and physician Ivana Schnur MD PhD, hopes to make this the future of medicine. Dreyer says that providers can look at Nuance’s For the Health of IT blog to get a sense for the wide array of apps built on Nuance’s platform. Each month, they feature one of their partners through their App of the Month blog feature. Another company, Plantronics, is making forays into the healthcare enterprise software industry with their Bluetooth headsets. 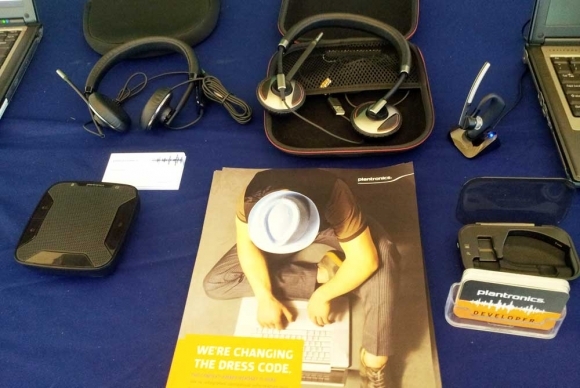 Plantronics’s newly-available software development kit (SDK) allows developers to access a headset’s serial ID, proximity information, and capacitive ID. According to Mike Holmlund of Plantronics, their REST- and socket-based API can allow apps to detect a variety of conditions. Apps can sense whether a nurse is at a particular workstation, route proper calls automatically to specialists who are already in front of workstations, and automatically begin dictations. In the future, Plantronics hopes to incorporate head-tracking, accelerometers, and other sensors to their Bluetooth devices. They are looking into the hospital environment as well as telemedicine. Developers can visit the developer homepage to get started working with their kits. Finally, one provider, m-Health Technologies, has created their own platform to let providers deploy applications without worrying about HIPAA compliance. The company’s scientist-turned-CEO Scott Jenkins describes it as “one-click HIPAA compliance.” It essentially wraps applications with password protection and token authentication, using soft authentication (passwords), wearable tokens (like watches or name badges), and even voice authentication. The scenario: a nurse needs to use an iPad in the ED. They enter their password, answer a question with their voice, and have their badge nearby. All of these will unlock the iPad’s medical apps so that the nurse can use it. However, if a code blue occurs, the nurse may set the device down and run to take care of the code. The iPad notices that their badge is no longer nearby, so it locks itself. After a few minutes, it can even call the nurse by phone. If it doesn’t receive a response, it can sound an alarm, then automatically self-destruct the data on the system. More details on their platform are at www.m-healthtech.com. Why are platforms and API’s such a big deal? They considerably cut down on the amount of time it takes to develop an application. Budding developers can get their app released faster. Healthcare providers can, essentially, view apps using existing platforms and API’s as the “high-yield” way to create an app. Steven Chan, M.D., M.B.A., is a resident physician at the University of California, Davis Health System, researching mobile technology, psychiatry & human behavior. Steve previously worked as a software and web engineer as well as creative designer at Microsoft & UC Berkeley. Visit him at www.stevenchanMD.com and @StevenChanMD. is a resident physician in psychiatry & human behavior at the University of California, Davis School of Medicine, and is current American Psychiatric Association (APA) & Substance Abuse And Mental Health Services (SAMHSA) MFP Fellow. He's currently researching asynchronous telepsychiatry & mobile healthcare applications. Steve previously worked as a visual designer and software engineer at both Microsoft & UC Berkeley.